Prompt: What prompts you to write? Is quarter to ten too early in the morning to roast garlic? I wrap three cloves in a square of foil and toss them into the oven. 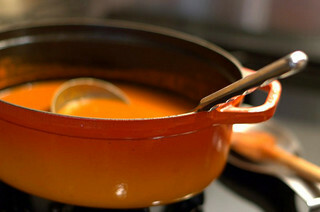 Over the next half hour, I smell its perfume throughout the house, filling an absence, promising a grand lunch of tomato heaven soup. As a child I drank large quantities of Campbell’s tomato soup. Smooth and sweet in the red and white can Andy Warhol called art. But as an adult, it is all wrong. My tongue grumpily identifies the different flavors like a series of Burma-shave signs flashing by: metallic tang, corn syrup, salt—all signifying “tomato” in a single slurp. But it is not like a tomato. Not like the perfect one I tasted, anyway, somewhere along the Eastern shore of Maryland when I was 22, sunburned, and in love. We had stopped at a roadside stand and bought a sack of tomatoes. Before we got back into the car, we picked out one, still warm from the sun, sliced it open, and sprinkled it with salt. I can remember standing there on the gravel drive, squinting, as my half dissolved into a red elixir on my tongue, golden seeds and table salt crunching between my teeth like sparks. The love has since faded. The memory has not….